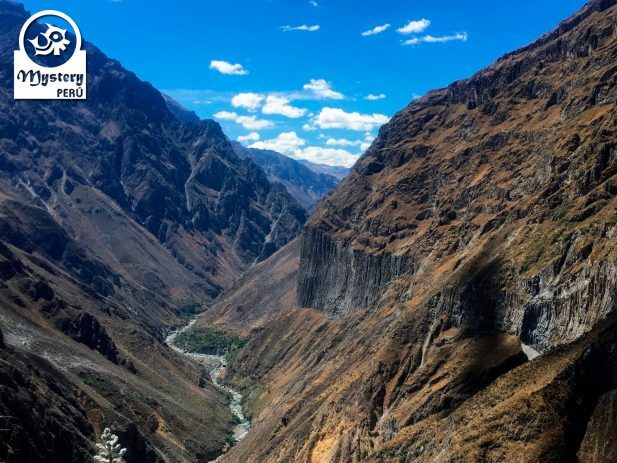 Our Colca Canyon & trip to Puno 2 Days Tour is a fantastic journey that takes you throughout the Andes till the cliffs of one of the deepest Canyons on Earth. Day 1°: Day 1º: Bus ride to the Colca Canyon – Overnight at the Colca Valley. Our guide will pick you up from your hotel in Arequipa. Afterwards we join a group of tourist on a bus and start our trip. On route we will stop at Pampas Cañahuas (3500 m/11,482 Ft), a National Reserve where visitors may spot Vicuñas. Unlike the llamas or Alpacas camels, Vicuñas are wild animals, and you can still see them running freely on these high plateaus. Following an ascending road we will arrive at the zone of Viscachani, where we stop to stretch our legs and drink a coca tea or use the restrooms. At the highest point of the road, we will get off the bus for some minutes to observe at the distance the volcanoes of Arequipa. Among them we can see the volcanoes Ubinas, Mismi, Misti, Chachani, Sabancaya (active) and Ampato. In Chivay we will have lunch at a local restaurant. After lunch we will go to our hotel. Afterwards we will return to the hotel. At the restaurant we can also enjoy live Andean music and typical dancing. 2° Day: Early visit to the Cruz del Condor – Bus to the city of Puno. The bus ride to the Cruz del Condor takes 2 hours. The road offers great views of the Colca River and the surrounding mountains. We will make some stops for photos along the way. After some time we will reach the zone known as Cruz del Condor. The reason we visit this lookout point so early is because at the site one can easily see Condors flying over the canyon. The condors usually fly over the zone during the morning, so it will easy to spot them while we are there. In addition visitors will have also time to walk along the edge of the canyon and take great photos. At around 12:00 hrs, we will stop at a local restaurant for lunch. Finally we will take a tourist bus to the city of Puno. The trip to Puno takes 4 hours and offers fine views of little lagoon located along the road. Upon your arrival in Puno, our driver will take you to your hotel. Our Colca Canyon & Trip to Puno 2 Days Tour is subject to availability. 06:00 h. Visit to the Cruz del Condor lookout point. Colca Canyon & Trip to Puno 2 Days Tour. Especial tour to the Colca Canyon, starting in the city of Arequipa and ending in Puno. Our Colca Canyon trip includes the visit to the natural look out point known as Cruz del Condor and the thermal pools.